The Harvest Moon appears in the night sky closest to the Autumn Equinox and Mabon. With an equal amount of day and night, the Equinox acts as a turning point; from here on out, we will experience longer nights than day. Tonight's Full Moon is also a Lunar Eclipse. Eclipses act as gateways to change. Deep transition is occurring on many levels and there is a new You on the other end. Subconscious emotions, wounds and habits may be coming to the surface right now. With the Full Moon taking place in the watery sign of Pisces, we are sure to experience some heightened emotions as well as deeper intuition. This Full Moon is known as The Harvest Moon. A time of harvest, cultivating abundance and expressing gratitude. The perfect mindset to set the tone as we enter the colder months ahead. Fall and Winter are the seasons of death before rebirth. As with any transformation, it's important to set some intentions. What do you want this rebirth to look like for you? What new chapter are you stepping into? As fall's chill creeps in, we turn to the comfort and warmth of the indoors and prepare the harvest for the coming Winter. We will be doing some Kitchen Witchery today using the element of Fire. This Ritual can be done outdoors, or indoors in the kitchen. Just be sure you have a fire safe container or a fire pit. What did your harvest look like this season? You may not be a literal gardener, but you are still a creator. What did you cultivate this season? What growth did you notice. Take time to reflect on the growth that occurred for you. What are you wanting to plant for the following spring? Try pulling the Harvest Moon spread from the guidebook to help aid with this Full Harvest Moon Ceremony. 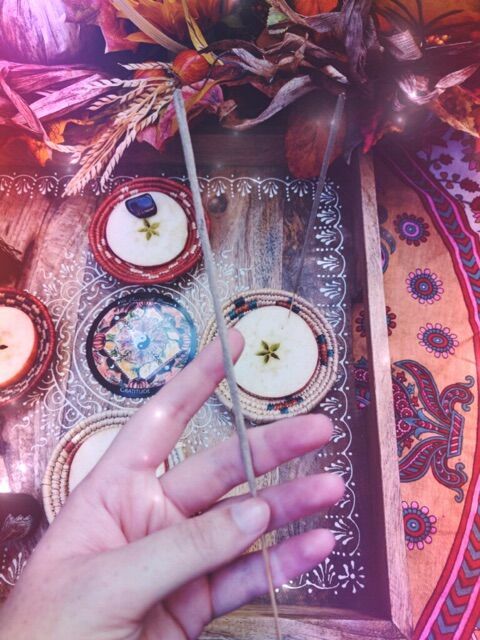 This Full Moon ceremony is focused both on gratitude and setting solid intentions for the months ahead; while enjoying a delicious and magical treat in honor of Mother Earth's Blessings. Apples are a common symbol of the fall harvest, but they also have many magickal properties. When cut horizontally, a pentagram can be seen in the center. Apples are a symbol of the goddess, and gateways to hidden knowledge. They have long been used in love spells, protection rituals, and are used for medicinal and many other magical purposes. We are also using some other simple spices you may already have in your cupboards that also hold magickal properties. Cinnamon is commonly used for purification, prosperity, good luck, love, and wisdom. Nutmeg is used for good health, protection, divination, love and luck. We will also use dash of honey or other sweeteners to add sweetness and love to your intent. The measurements here are just estimates, you can add as much or as little of the spices and sweetener as your taste prefers. Some apples may call for more honey. Slice or cut your apples any way you'd like. For this ritual we sliced ours horizontally down the center to show the pentagram. After seeded and cooked, the core of the apple is tender enough to eat! Chop up or pour some coconut oil in with your apples. Add cinnamon and nutmeg, and sweeten to your liking. You can add some almond meal to help give the roasted apples a crunchy feel to them. Be mindful as you add youringredients. Kitchen magick evokes ritual in the every day act of cooking. Remember the meanings and intentions of the ingredients you use. You can chant the inaction below as add your ingredients. We ready the harvest for the months ahead." And prepare for Winter Soul's Rebirth." Fold your apples into the tinfoil leaving some air and tucking and folding the corners to make sure the juices won't leak. You can even wrap it in another sheet of tinfoil. Shake your apples to coat them with all the spices and sweeteners. You could also stir it all up before hand if you'd prefer. You can place your apples in a Full Moon bonfire's hot coals for 20 minutes, or simply place the tinfoil in the oven at 350 for 20 minutes until the apples are soft and golden brown. If you are cooking indoors, you can just place your ingredients on a baking sheet and roast them that way to not waste aluminum foil. If you are cooking in a fire, be sure to rotate the apples with some long tongs every few minutes so they don't burn! While your apples are cooking and sweetening in the fire, it is a good time for gratitude and intention setting. Take a few moments to reflect on the summer months. What have you learned? How have you progressed? What kind of blessings and gifts came into your life that you can be thankful for? 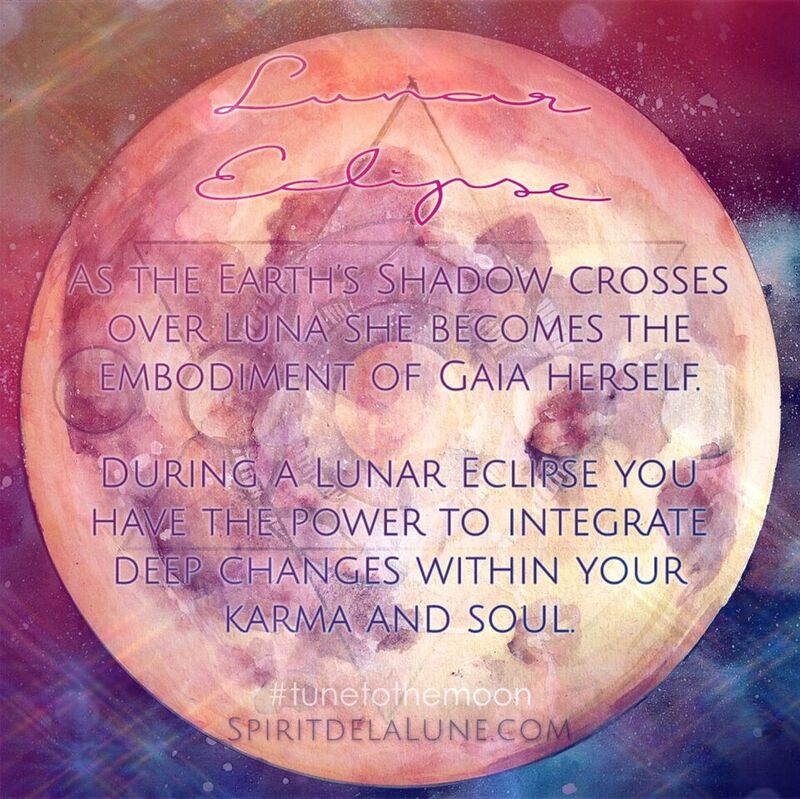 Journaling on a full moon eclipse can help you really dig deep into your subconscious. Because we are focused around gratitude, be sure to start your intention with "I am so thankful I..." instead of anything focused around "I want" or "I need." The universe loves action and writing is a very powerful tool when it comes to manifesting your desires and achieving your goals. Be sure to state your intentions clearly and from a space of gratitude. Because the season is turning into the colder months, we are going to activate our intentions with the transformational power of fire. In a safe fire-proof container, or your bonfire safely set your intention on fire. Watch the flame engulf your words, and allow your intention to burn up and drift away into the cosmos. Action has been taken, have faith that the next steps will be revealed to you. Trust in the unfolding. After about 20 minutes, your apples should be nice and golden and ready to be enjoyed under the Full Moon. 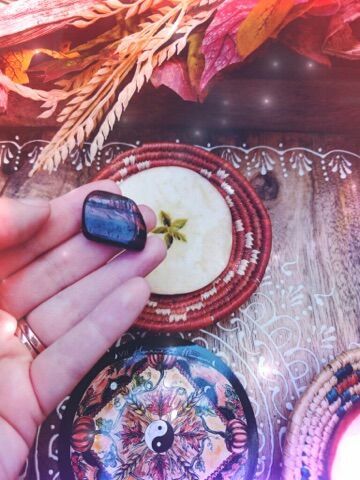 Don't forget to charge your deck and your crystals tonight under the powerful Full Moon Eclipse! We are particularly excited about this Full Harvest Moon! We have submitted all of our final design work to our printers and are very excited that the deck is in production! The deck's main design has stayed the same, though we made a few minor adjustments to the font size so the cards are easier to read. We also tweaked the backs of the cards a bit since we found a printer who could help us follow our initial idea of the deck. We also added a bit to the guidebook. There is a further explanation of the Zodiac cards, and a new and improved glossary. The guidebook is also square and will fit into the new packaging. We decided to design an entirely new box for Spirit de la Lune. Something that can fit both the deck and the box. We are sad to see the tins and bags go, (and may offer them as an add on later.) but we are in love with the new box design! We can't wait to show you what everything looks like! Thank you again for your patience and support, & have a Happy Full Moon!